OK, so I was way off for my predictions in 2004. In fact, I only got one right – President Bush was re-elected (possibly two right if you consider Brittany Spears marrying one of her dancers the equivalent of gaining 150 pounds). Of course, being wrong doesn’t stop psychics from trying to predict events every new year. So here are my unlikely predictions for 2005. 1. MoveOn.org will realize their dream of defeating George W. Bush was hopeless and that any tries to impeach the President will fail. They will embrace capitalism and rebrand their site into a moving company – changing their name to MoveYourHouse.org. Look for their bright red moving vans in 2005. 2. Michael Moore will go on a diet. 3. PETA will rally their forces and provide animalarian aid to the hundreds of thousands of domesticated animals who were left homeless after the great tsunamnis in December 2004. Included will be hundreds of animal psychologists dispatched to the area to provide grief counseling for any depressed animals. PETA will also move to outlaw any further tsunamis that may harm animals. 4. Big & Rich (Honeybun’s new favorite group) will release a new album that will usher in an era of peace in the Middle East. 5. Something major will happen somewhere at some time in 2005. (That should be sufficiently vague to guarantee a correct prediction). 6. Anna Nicole Smith will give up her fight for her late husband’s wealth – the one who died at the age of 90 – to become a Buddist monk (or maybe that is boobist monk….bah dum dum). 7. A summit on the state of the world’s environment will degenerate into a riot as the “global warming” faction attacks the “global cooling” faction during a speech by keynote speaker, Sting, on the plight of the rainforest. 8. In 2005, Hollywood will produce a good movie…..one good movie. 9. John Kerry will revert back to his natural color. Then again, he may declare “My truth is that I’m a Pumpkin-American.” Liberal columnists across the nation will then commend him for his integrity. 10. Millions of people who bought the Livestrong plastic yellow bracelets will come to discover they are wearing plastic yellow bracelets (see previous link). 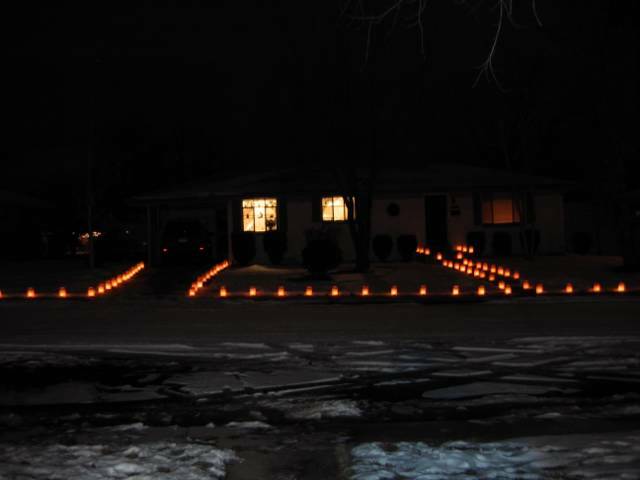 I’ve told a few people about decorating our house with luminarias on Christmas eve. Most people who were not from the Southwest kind of scratched their heads and couldn’t figure out why someone would put a candle in a paper bag. “Won’t they catch on fire?” was the most common question. No, they don’t catch on fire. Here is a shot of our house after they were all lit. Today will be spent at work until noon (sigh). At least I experienced my own little Christmas miracle this morning. I was expecting to have to scrape the frost off the car before going to work. But even though the temp was in the 30’s overnight, no frost. Clear windows. Now wouldn’t that just make your day? Our festivities will begin when I get home and open presents with Honeybun. My parents and brother will come over later in the afternoon for Christmas dinner – ham this year (mmmmmm – ham). An Ohio judge threw out a challenge to the 2004 election. Jesse Jackson is mad that George Bush won. So instead of holding to the rules of a democracy – the person that wins the election gets the office – Jackson is trying to get the election overturned. The complaint questioned how the actual results could show Bush winning when exit-poll interview findings on election night indicated that Kerry would win 52 percent of Ohio’s presidential vote. Without listing specific evidence, the complaint alleges that 130,656 votes for Kerry and John Edwards (news – web sites) in 36 counties were somehow switched to count for the Bush-Cheney ticket. Exit-polls are more reliable to Jackson than an actual vote count. In other words, Jackson doesn’t believe in democracy. He doesn’t want every vote to count, only the votes of those who said they voted for Kerry. Exit polls aren’t elections. They don’t accurately reflect vote counts. The only way to know who wins an election is to count the votes. When Ohio counted, Bush won. Democrats said they wouldn’t accept the election results if Bush won. Why is anyone even listening to these people. The danger is not that Bush won the election. The danger is that some Democrats want to overturn the will of the people. Any means necessary, right Jesse? Hugh Hewitt has once again asked for bloggers opinion on Jon Meacham’s Newsweek article Religion: The Birth of Jesus. In the article, Meacham claims that the story of Jesus’ birth is fiction – invented by the gospel writers to either cover up Jesus’ illegitimate birth. This is not an investigative journalism piece. Meacham starts with a theory – the Nativity is false – and provided only biased evidence in a misguided attempt to prove it is true. Albert Mohler pointed out how Meacham’s sources were from liberal scholars, mostly the Jesus Seminar. Meacham didn’t cite one source that thought the Nativity was factual – only statistics quoted in such a way as to make it seem that people who believe the story is factual are unreasonable. In context, there are “friends” or “people” who come to him. Then his mother and brothers (catholics believe brothers really mean cousin in this case). The point is, there is a distinction made between friends and family. Meacham puts words in Mary’s mouth claiming she said “He is beside himself.” The gospel writer is clearly making a distinction between Jesus friends in verse 3:21 and Jesus family in verse 3:31. Previously, I claimed that Meacham’s attempt at proving the Nativity is false is misguided. That is because Albert Mohler points out that Meacham claims to be “a believing Episcopalian.” Since the virgin birth is central to the story of Christ, how can someone believe the sacred texts of Christianity or lies, yet still claim to be a Christian? It is a contradiction that can’t be answered. If the Bible lies, then the Bible cannot be believed. A person who says he is a Christian but does not believe the Bible is truthful cannot be a Christian. You are either misguided in believing the Bible is false, or misguided in claiming to be a Christian. This seems to be a trend in liberalism this year. First we have John Kerry who claims his Catholic faith is important to him, yet does not believe he can use his faith to make decisions that will affect others. In fact, he must make decisions that go against his faith (such as supporting abortion). Now Meacham is trying to reinforce that view by claiming the religion that he believes in is a lie. The only conclusion we can draw from his position is that people should have their religion, but should not use it to form the guiding principles of their lives. Meacham’s article was not written to illuminate us on the meaning of Christmas. He is trying to tell us that Christmas is a lie and we should reject religion in general and Christianity specifically. It is alright to be a Christian as long as you know that Christianity is not worth believing in. Meacham’s example isn’t convincing though. He has shown faulty logic and biased “reporting”. What he has proved is that liberal writers cannot be trusted to provide a truthful discussion of Christiantiy. Doesn’t it feel like Christmas? We have officially decorated for Christmas. The Christmas tree is up and all the decorations are on. Honeybun did most of it. Well, she did all of it. She moved the few decorations I put on. She did such a great job, she was tearful when she finished. It looks great. She also decorated the tree with some cinnamon scented pine cones. Now when I say scented, I mean you can almost see the cinnamon in the air. These are the most powerful smelling things ever. The entire upstairs smells like a cinnamon factory. I think our neighbors can smell it. Don’t get me wrong, it smells good, but I’ve never had any scented things this strong. Honeybun said she bought them because she first smelled them two aisles away at the grocery store. 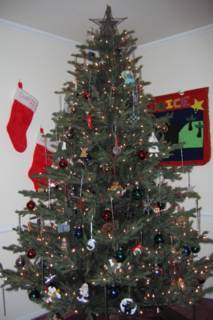 Although she decorated the tree, I did contribute. Last night I designed and printed up our Christmas cards and our annual Christmas letter. Its starting to feel like Christmas. Last night was my last class for the semester. I was going home not paying attention to how fast I was going and got pulled over. Every time I have been pulled over I have gotten a ticket (not there there have been that many times in all). Even though I am always respectful, I must not be a sympathetic figure. Last night was different. For the first time, an officer let me off. Whew! Christmas is not a good season for traffic ticket payments. I guess I’ll be paying a little more attention for a while at least. Here’s an inspiring blog. Sgt. Lizzie was wounded in Iraq yesterday by a roadside bomb. Her story is inspiring for her personal strength and her positive attitude. Hang in there Sgt. and thank you. I was driving yesterday and saw a bumper sticker trying to insult George Bush. Now George Bush has won four elections in a row – first beating a popular Democrat incumbent governor in Texas then getting re-elected before winning two Presidential elections. How many times does George W. Bush need to beat the Dems before they realize he isn’t stupid? The Dems who are convinced that Bush is stupid actually give the President an advantage. As long as they underestimate him, they won’t be able to beat him. While they are scratching their heads about how an idiot can beat them, he keeps winning. Author JasonPosted on December 5, 2004 February 12, 2006 Categories Politics4 Comments on When will they realize?